It sure has been a while. You know, when my last semester of junior year was coming to a close back in May, I did not imagine my short break for finals becoming a long summer break. I consumed a lot of media over the summer in order to flood the blog with weekly posts, but that just… didn’t happen. So, I guess the only thing to do now is to move forward, play some catch up, and take up the Media Monday mantle once again. I’m back! 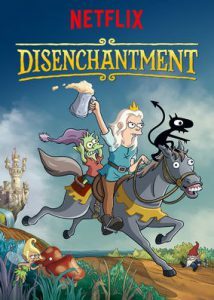 And what better way to start my return than with a brand new Netflix series: Matt Groening’s Disenchantment. Coming off the heels of his previous two wildly successful animated series’, Matt Groening’s Disenchantment moves away from the distant future and modern day family in favor of a wild new medieval fantasy setting. The show follows Princess Bean, the daughter of the king of Dreamland who desperately wants to be anything but a princess. Together with new friends Elfo, a tiny elf who wants to escape the monotonous happiness of the elves, and Luci, a cat-like demon, Bean’s life is turned upside down through a series of small adventures and horrible incidents that make her reconsider all of her life choices. All of the staples of a Matt Groening animated comedy are there, which is both the greatest asset and biggest weak point of Disenchantment. The classic Groening style of humor is there, mixing witty (or downright goofy) jokes with references, parodies, and animated slapstick. The funniest character by far is Elfo, who just never fails to crack me up. The voice performances are key to humor of the show, and the cast is filled with familiar voices. Billy West, John DiMaggio, Maurice LaMarche, Tress Macneille: all returning from Groening’s other works, specifically Futurama. Newcomers to Groening’s work within the cast include Abbi Jacobson, the voice of Princess Bean; Nat Faxon as Elfo; and my personal favorite addition to the cast, the hilarious Eric Andre as Luci (as well as a few other additional voices). The cast and comedy both give a unique and fun vibe to the show, but stellar animation really pulls it all together. However, as I mentioned above this is not always a good thing; Disenchantment, when inevitably compared to Groneing’s previous work, seems stale and not as strong by comparison. The first part of Disenchantment is currently on Netflix in the form of 10 roughly 30-minute episodes. As this is just the first part of a larger tale, one of the shows biggest downfall lies in how long it takes to find its footing. The first 3 or so episodes drag on as the show works overtime to really find its tone and feel in the few episodes it has. However, once it does find its footing, Disenchantment begins to blossom into something truly unique. A blend of comedy and heart, I look forward to seeing Part 2 when it arrives, hoping for a solid season full of quality, like the back three-fourths of Part 1. As I mentioned above, Disenchantment is currently only available on Netflix. If you are a fan of Matt Groening, or animated comedies, I would recommend giving the show a watch. While it currently isn’t anything amazing, I get the feeling we will see greatness come from this show, akin to Futurama or the golden age of The Simpsons. It feels good to be back! I wonder what I’ll write about next? If you have any suggestions for what I should write about next, leave them in the comments below, or shoot me a tweet over on Twitter @grantshere.